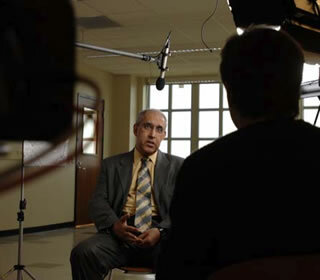 (Jan. 24, 2007)--The robotic swarms of Mo Jamshidi, UTSA professor of electrical engineering, and his graduate students will be featured this spring in a 13-episode public television series. "State of Tomorrow," a 30-minute program that will run on 13 PBS stations in Texas, will include UTSA's rover robotic swarms. Designed to assist the military in the war on terror, the robots are equipped with biosensors and global positioning system (GPS) technology to enable them to go into dangerous areas and detect improvised explosive devices (IEDs) or biological and chemical weapons. "State of Tomorrow" is co-produced by Austin-based Alpheus Media and will air on Austin and San Antonio PBS stations from late February through June. The show will focus not only on technical issues but also on the human side of stories. According to UT System senior writer Ruth Pennebaker, each episode of the 13-part series will be broken into two-to-three segments with the goal of increasing public awareness of research and economic development work at higher-education institutions across Texas. The series also will examine some of the state's greatest challenges ranging from energy to homeland security to health care. "We want the public to know that higher education is not simply important to just people on our campuses or for families that have students there," said Pennebaker. "It's also important for the entire state to know about the work that is going on in economic development and research that benefits all of us, ultimately."